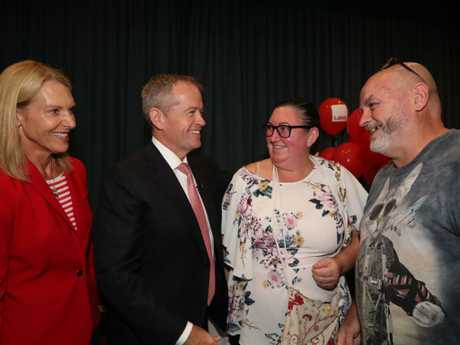 EMOTIONAL supporters have turned out to Bill Shorten's town hall meeting in Woy Woy, with a breast cancer patient thanking the Labor leader for his newly-announced policy. 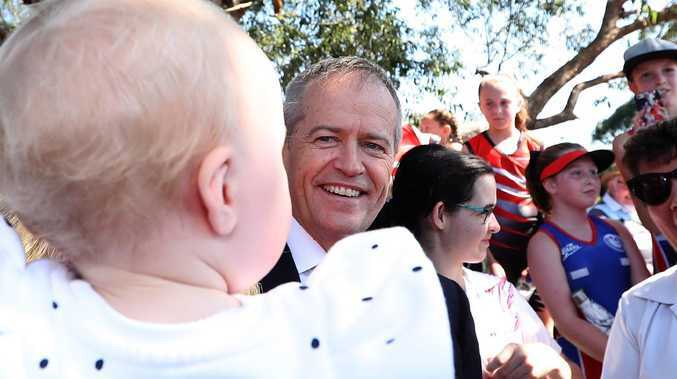 This afternoon Mr Shorten visited Everglades Country Club in Woy Woy, deep in the marginal seat of Robertson, for his first town hall event of the campaign. Hundreds of voters showed up - there weren't nearly enough seats - but one of them, a woman named Trish, stood out. Trish, a registered nurse from the NSW central coast, was recently diagnosed with advanced breast cancer. "I've actually spent almost $10,000 in the last five weeks in out of pocket expenses, and I can't work either," she said. "Sorry, I'm probably going to start crying in a minute. But I just really wanted to thank you for the cancer plan. It may not be for me, I'm just grateful it will be there for other people, who will be able to experience that and not have the pressure that I have, and the financial burden that this is leaving for my family. "Especially when I may not be alive in five years' time for them to actually … I'm sorry. At least it'll be around for other people." Trish's words shifted the tone of the room. The next questioner told her "all of the love in this room is for you", to warm applause. Mr Shorten himself said the same thing. "I've done 85 of these town hall meetings. There's always someone who just makes you realise that there's stuff more important than the day-to-day rubbish," Mr Shorten said. "Trish, you need to hear this. People love you. We only wish the best for you and your fight ahead." The town hall covered a range of other subjects, including the fate of Julian Assange. One questioner compared Mr Assange's plight to that of Australian journalist Peter Greste, implying he deserved more help from the Australian government than he is currently receiving. Mr Shorten said he "wouldn't necessarily call Mr Assange a journalist", but did say he would ask Labor's spokespeople to get in touch with Mr Assange's lawyers. 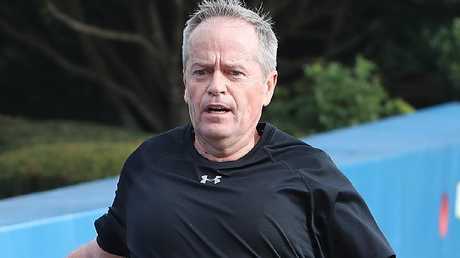 Shorten is known as a keen and consistent runner. Scott Morrison experienced an awkward moment on the campaign trail today during his first walkabout. The PM did his first street walk in Strathfield today, tucking into a Korean dumpling and helping out in the kitchen. But he misunderstood one woman's greeting, saying "ni hao" in response (hello in Mandarin) only to be told she was Korean, not Chinese. 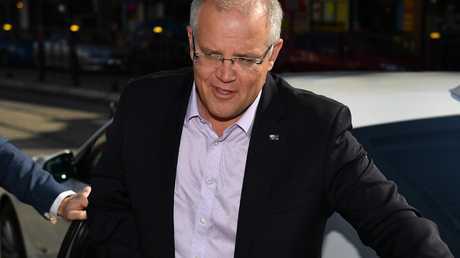 "No no no, I'm Korean," the woman replied.
.@ScottMorrisonMP has had his first street walk of his campaign in the inner west Sydney suburb of Strathfield, greeting locals and visiting a restaurant. @annelisenews: There was a bit of confusion about what kind of restaurant he was in. Mr Morrison visited several businesses located in the seat of Reid, stopping for selfies and shaking hands with locals. He was greeted enthusiastically by locals and also took the entire media pack into a bakery and dumpling restaurant to greet diners and staff. As the cameras flashed around him, Mr Morrison helped put cream on a sponge cake and later tried his hand at making a dumpling. "I think you do it better than me," Mr Morrison joked to the woman instructing him on his sponge. "I'll keep my day job, how about that?" Mr Morrison even showed off his chopstick skills, taking a bite out of a dumpling for the cameras. Mr Morrison later visited Royal Randwick for Winx's last race, giving high-fives to the crowd after the mare's record-breaking win. "It was just spirited. And the way the crowd carried it home was just wonderful," Mr Morrison told AAP after the race. 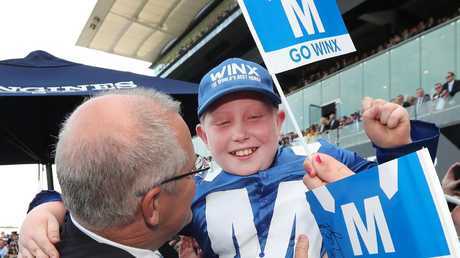 Mr Morrison ran and high-fived the crowd following the victory, stopping to talk to a young boy dressed in replica Winx silks. "The little boy up there Lucas, oh man, there were tears running down his face," he said. "He's going to remember that, like we all are, for the rest of our lives. "To come and be here and be part of that was just tremendous." The prime minister waded through the crowd taking photos with punters before taking his position in the owner's enclosure for the race. He was given a $10 ticket by a bookmaker and mounted their stand to have a chat. While he got a fairly good reception from the crowd - especially Cronulla fans - there was the occasional sledge from some well-lubricated racegoers. "Where's Malcolm?" one man repeatedly shouted. But he had his fair share of supporters, including the man who said: "Smash 'em, Scott. No Billies." It was a exuberant finish to a day that started with his announcement of extra mental health funding. Mr Morrison was joined by his wife Jenny on the campaign trail at his first stop in Ashfield. Visiting the mental health organisation Headspace, Mr Morrison announced $42.1 million in funding for youth and indigenous mental health research. Afterwards Mr Morrison held a press conference, where he was grilled about the withdrawal of two Victorian candidates who were found to be dual citizens. At a press conference Mr Morrison also appeared to accuse the Labor Party of racism. When asked about Tanya Plibersek's comments that Adani could not be trusted to bring jobs to Australia, Mr Morrison said: "I think there's form here from the Labor Party. "It took Bill Shorten six days to denounce what Michael Daley said about Asians taking people's jobs. And he only said it after he lost the election. What would he have said if Michael Daley had actually won the election? "Now we've got Tanya Plibersek saying Indian businesses can't generate jobs." Mr Morrison was also asked about reports Malcolm Turnbull's son was orchestrating donations for Liberal Party defector Julia Banks' campaign to unseat Health Minister Greg Hunt. He defended his minister but stopped short of saying he wasn't a climate change denier. "Greg Hunt has been the leader when he was environment minister of ensuring that we turned around, a 700 million tonne deficit in reaching our Kyoto 2020 targets that was left to us by Labor," Mr Morrison said. "Because of the policies Greg Hunt put in place, we will now beat that target for Kyoto 2020 by 369 million tonnes. "Greg Hunt is someone who has delivered in every single portfolio that he's been given, in the environment, in health, he has delivered for all Australians. And I defy anyone to find someone in this country who was more passionate about the healthcare and wellbeing of Australia." Peter Dutton has apologised to his Dickson opponent Ali France for claiming the Labor candidate in his seat, Ali France, had used her disability as an "excuse" to avoid moving to the electorate. The Home Affairs Minister tweeted on Saturday afternoon: "I apologise to Ms France for my comments yesterday. My argument with the Labor candidate is about how our respective policies would affect the people of Dickson." Ms France's left leg was amputated above the knee after she was struck by a car in 2011. She managed to push her four-year-old daughter to safety. 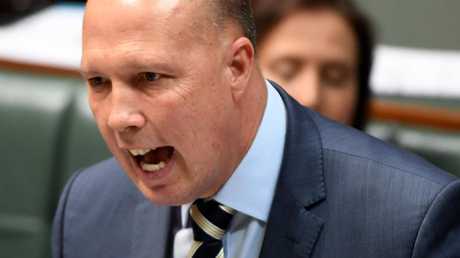 Mr Dutton's apology comes after Bill Shorten and Kristina Keneally unleashed an extraordinary attack on Mr Dutton this morning, calling him a "thug" and suggesting Prime Minister Scott Morrison is his "hostage". Speaking at a press conference in Gosford, the pair demanded Mr Morrison tell Mr Dutton to apologise. "I am shocked, one, that Peter Dutton has not had the good grace to apologise and two, that Mr Morrison hasn't asked him," Mr Shorten said. "I don't understand why Mr Morrison hasn't asked him to apologise, other than that he's a hostage of Mr Dutton." He then ceded the microphone to Senator Keneally, who recently campaigned alongside Ms France in Dickson. "Last week Scott Morrison stood in front of the nation, called a royal commission into the abuse of people with a disability, and he showed tears. He showed tears there in the courtyard. 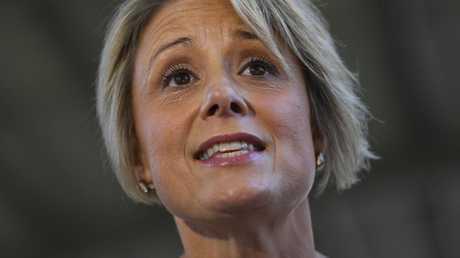 And I give him credit for baring his heart, showing his compassion, and standing up for people with a disability," Ms Keneally said. "This week, Peter Dutton launches a mean, low, despicable attack against a woman with a disability, Ali France. A mother who lost her leg shielding her child from a car accident. And Mr Morrison has remained silent. Mr Morrison has said nothing. "You cannot stand in the courtyard and shed a tear for people with disability and then the very next week turn a blind eye. "Why has Mr Morrison not stood up to Peter Dutton? Why is Mr Morrison not demanding Peter Dutton apologise, not just to Ali France but to all the people who live with disability in Australia who struggle to find appropriate accommodation?" Ms Keneally went on to imply Mr Morrison was scared of Mr Dutton's influence in the Liberal Party. "Is Mr Morrison afraid of Mr Dutton? Mr Dutton, after all, is a thug. Mr Dutton is the most toxic man in the Liberal Party. Mr Dutton's mean and despicable. And Mr Dutton came within a few votes of becoming the prime minister. "This is a Liberal Party divided by anger, fear and loathing for one another. "Somebody in the Liberal Party needs to stand up to Peter Dutton. That somebody should be the prime minister. "I am frankly gobsmacked that Mr Morrison has not had the courage to call Peter Dutton." 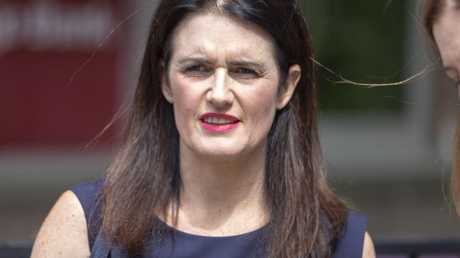 She stopped short of demanding Mr Dutton's resignation, saying an apology would simply be a "good first step". The federal election campaign has already descended into chaos, with candidates from both major parties suddenly withdrawing from the race. The Liberal candidates for the Victorian seats Lalor and Wills, Kate Oski and Vaishali Ghosh, have both quit after it emerged they were likely ineligible to sit in parliament due to constitutional concerns over dual citizenship. "The party's vetting process identified there was a possibility neither would meet strict citizenship requirements under section 44 of the Australian constitution in time for close of nominations," the Victorian Liberal Party said. "We thank our outgoing candidates and are in the process of identifying new candidates." Meanwhile, Labor's Melissa Clarke has quit the contest for Julie Bishop's seat, Curtin, over controversial comments she made about Israel. 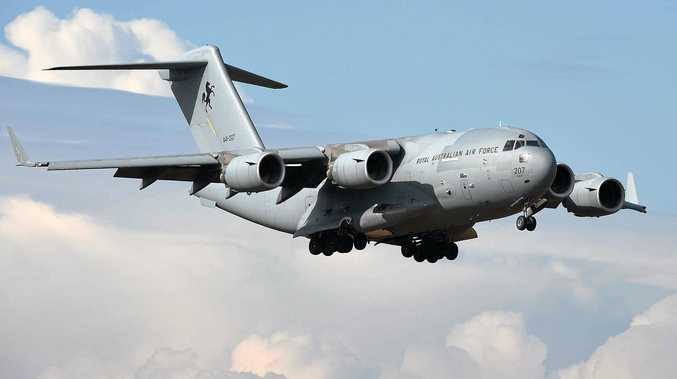 Ms Parke, who was selected as a high profile candidate for the electorate in an effort to draw Liberal resources away from more marginal seats, told a public meeting last month Israel's treatment of Palestinians was "worse than the South African system of apartheid". "I've had 20 years' experience in international relations and law including living and working in the Middle East. My views are well known," Ms Parke said yesterday. "But I don't want them to be a running distraction from electing a Labor government." Ms Parke previously served as the federal MP for Fremantle, but lost that seat at the 2013 election. The Prime Minister was later grilled about the two Liberal candidates in Victoria. "These were candidates in not what I'd call highly contested seats," the PM said. "It's still a complicated issue … and what it shows is we're doing the due diligence and I'm sure the Labor Party and other parties are doing the same. When asked whether he could guarantee there were any other candidates that could be caught out, he said: "What I'm saying is the party has put its process in place and has identified the areas where there needs to be changes." 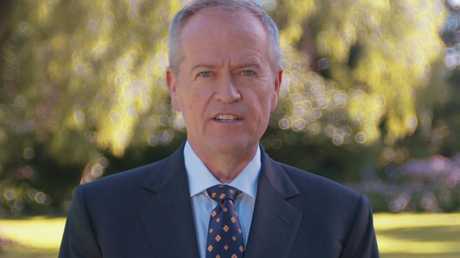 Bill Shorten will face awkward questions about a meeting with Australia's richest man as his campaign visits New South Wales' central coast today. Mr Shorten wrapped up his public campaign events early in the afternoon yesterday after touring a medical centre in Sydney. Then he reportedly visited the luxurious apartment of Anthony Pratt, where the pair shared lunch. Mr Pratt has a $13 billion fortune, built through his cardboard box business Visy. He is a frequent political donor. At the last election he contributed nearly $800,000 to Malcolm Turnbull's campaign. Today Mr Shorten is heading to Gosford, where he will maintain his focus on cancer policy. This morning Labor announced it would spend $8.6 million with the Cancer Council for a renewed public awareness campaign on sun protection. Later he will face voters at his first town hall forum of the campaign in Woy Woy. Those events take him to the marginal Liberal-held seat Robertson, which is seen as a prime target for Labor. The incumbent MP Lucy Wicks is sitting on a margin of 1.1 per cent. Yesterday Mr Shorten also spent all his time in Liberal seats, a sure sign that he is on the attack. He visited Reid, held by retiring Turnbull loyalist Craig Laundy, and Bennelong, held by former Australian tennis star John Alexander. Prime Minister Scott Morrison's first campaign stop today is in the inner west Sydney suburb of Ashfield, in the seat of Grayndler and on the border of Reid. Mr Morrison will visit a Headspace youth mental health centre to announce a $42.1 million boost to Youth and Indigenous mental health research if the Coalition wins re-election. 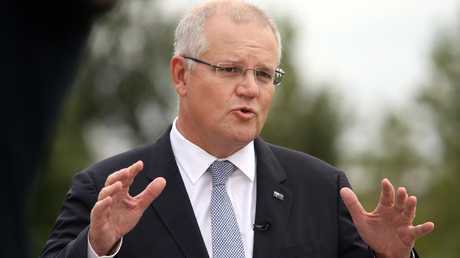 As the election campaign heads into its second full day, Prime Minister Scott Morrison has said he will significantly increase the money announced for youth mental health. As part of its Budget released earlier this month, the Coalition had already announced $461 million for youth mental health including for 30 new Headspace centres. Today's extra money will bring total funding for the Youth and Indigenous Mental Health and Suicide Prevention plan to $503.1 million. "I want every young person in Australia to know that they are not alone and that we are committed to doing everything we can to support their mental health and wellbeing," the Prime Minister said. "Not just as a Prime Minister but as a parent I am going to do whatever it takes and whatever we can to break the curse of youth suicide in our country and ensure young people get the support they need." Suicide is the leading cause of death among Australians aged 15 to 44 years and almost half of all Australians will experience a mental health difficulty in their lifetime. Three quarters of mental illness begins before the age of 25. The new funding will support five projects as part of the $125 million Million Minds Mission, which aims to get one million extra Australians into new trials and programs focused on protecting their mental wellbeing. The government says extra grants for eating disorders research will also be announced soon. Of the $42.1 million announced today, about $10 million will go towards two research projects to deliver digital tools for common issues faced by young people including anxiety, depression, substance abuse, sleep problems, suicide and relationship difficulties. The projects hope to improve the treatment and experiences of those presenting to emergency departments with mental health crises. Another $12.5 million will be spent on three projects to bring more social and cultural awareness to mental health services for young Aboriginal and Torres Strait Islanders, to make them more effective. Mainstream mental health and alcohol services will also be supported to work better for Indigenous Australians. "Young Indigenous people face many barriers to accessing health care, one of which is finding and engaging services that are safe and tailored to meet their needs," Minister for Indigenous Health Ken Wyatt AM said. "This work will help change the way we deliver general mental health services so that they draw on the value of culture, community, and country to enrich the care provided to our First Nations people." The announcement comes as Labor campaigns hard on its health funding promises, including a $125 million research funding promise to improve cancer survival rates as well as billions to reduce out-of-pocket-costs for millions of medical scans.